Email us a write-up of your trip to Durban and we'll send you a travel voucher! Ask a travel agent - our travel bugs are itching to help you! Whether you're a beach-bum looking for some funsunzi or a hillbilly wanting the inland experience, Durban hotels & guest houses, offer the opportunities to enjoy it. The first thing you want to do is decide which area to stay in. Those holiday-makers who prefer something more exotic (and arguably safer) stay at hotels on the outskirts of Durban like Umhlanga, Umdloti, Ballito or Salt Rock. If you plan on travelling inland then choose a spot on the outskirts of Durban - there are some lovely guest houses, like Eagle Wind Manor. There are no BnBs near the beach in Durban. However, if you travel a bit further north to Umhlanga, Umdloti, Salt Rock or Ballito, you'll find some there (and better beaches than in the city!). 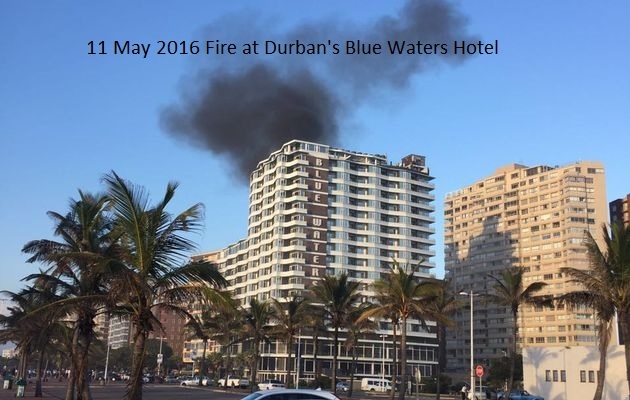 Around 06h30 in the morning of the 11th May 2016 Durban's Blue Waters Hotel caught fire, apparently after a transformer near the basement exploded. The fire was extinguished by 08h30. Two people were treated for smoke inhalation. 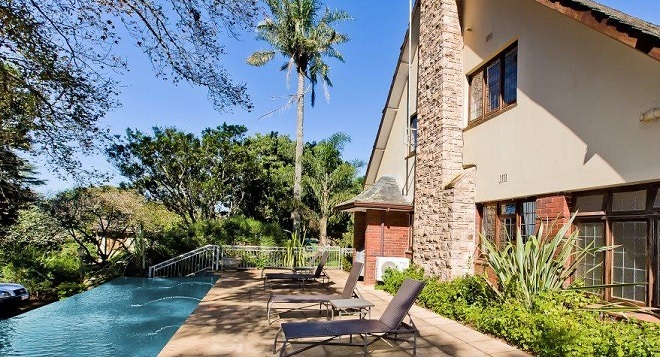 We recommend staying at the Eagle Wind Manor which is a 4 star guest house equidistant between Durban and Pietermaritzburg, at the start of the Valley of 100 Hills. The guest house can be used as a launching pad for adventures to a traditional Zulu town, and day trips into Durban to relax on the beach, or to the scenic Natal Midlands. It's 200m from Kearsney College, and the proverbial 5m by car to restaurants & shops in Hillcrest. To make a booking email your host, Jo Gibbon, at joanne@eaglewindmanor.co.za or phone 031-765-8993 (if the landline doesn't get through, phone on her cellphone at 083-357-8463). The manor is available for weddings, here's what Mr & Mrs Thompson had to say: "your venue is really one in a million and we are so thrilled we chose it for our special day! It was just perfect and fitted with our vintage romance theme! From the setup to the clear down as well as accommodating all our extra breakfast guests you were all such good help. You were all so accommodating and made us feel right at home! We will gladly recommend your beautiful venue to anyone. All our guests have given us phenomenal feedback of how perfect our evening was and part of that is thanks to you and your team." 10 Woodlands B&B is the place to stay in Durban, making sure that you get the balcony suite which faces the harbour. The B&B offers tranquility in upper Glenwood. Use the pool & enjoy the pretty garden. NB There are dogs there, and the pools are unsecured (so no kids under 12 years old allowed). Auberge Hollandaise Guest House, Kenneth Kaunda Drive. Helpful staff, easy drive to and from the airport, spatious rooms, breakfast served overlooking the pool, a number of restaurants nearby. Ask for a room with a balcony & sea view (unless you prefer a ground floor room leading onto the pool). Durban city's beachfront is known as the "Golden Mile", and offers a beautiful walk, including onto the piers jutting out to sea. Hotels in close proximity to the sea are the Docklands Hotel on Durban's Waterfront, the Tropicana Hotel, Beach Hotel, Garden Court South Beach, Balmoral Hotel, Protea Hotel Edward, Parade Hotel, Southern Sun Elangeni & Maharini, Belaire Suites, Blue Waters Hotel and Sunsquare Suncoast. The Road Lodge and Formula One Hotel are two of the cheapest spots to stay in Durban. 10 May 2013: The Southern Sun Elangeni & Maharini launches as the largest hotel in KZN, a combination of the Southern Sun Elangeni & Southern Sun North Beach. 18 December 2012. The Upton Hall Guest House on Eastbourne Street closes due to "the economic environment and spiralling costs" - it was known for its balcony suites with views of the Moses Mabhida Stadium / Durban waterfront. October 2012. The Oyster Box Spa is SpaFinder Wellness Readers" Choice as the Best Spa in Africa. The Grange Guest House overlooks Durban City and is a 10 minute drive from the city and the beach, and close to quality restaurants. Rooms are spacious. Stay in the room with the rooftop garden!